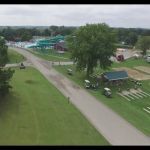 Ask fellow campers about "River Bend RV Resort" and nearby attractions. This is our favorite Wisconsin campground! We enjoy the atmosphere and the convenience of having so much to do. The pool/waterpark is clean, and well kept. As a mom of two little ones, I appreciate the lifeguard staff, and the fact that the pool area and beach are right next to each other. The mini golf, frisbee golf, and pedal bikes are all rented with a deposit that you get back upon returning the items - this is a nice feature being able to do these things for free. This campground allows you to have one RV and one tent per site, which has been nice for having others camp with us. There are fun activities planned on the weekends - and our kids enjoy the activity center, jump pillow and playgrounds. This is a friendly, fun campground. We have stayed 4 times, and plan to keep going back! Helpful note: it can be noisy late - especially on bigger weekends, like Memorial Day weekend when they have a live band play. This didn't affect us that much with being in our travel trailer, but we had friends staying on our site in a tent, and it was hard for them to sleep - they were pretty crabby the next day. We camped at River Bend RV Resort in a Travel Trailer. Horseshoe, volleyball, baseball areas all look fairly well maintained. The Frisbee golf course was decent. I'm sure not many people play that. The skate park I was really looking forward to, was nothing more than a cracked up, abandoned tennis court. The actual tennis court didn't look much better. Both of which should be taken off their advertisements. The dunk tank I didn't look for but didn't see either. We camped at River Bend RV Resort in a Fifth Wheel. Walmart is close for forgotten items. The brewery near by in Lake Mills has great beer and live outdoor bands during the summer. We went camping for Labor Day weekend. It was a crowded, dirty, chaotic campground. Everyone seemed to be drunk most of the time, including every afternoon. This is not family friendly at all! While at the bathroom, we saw a dog hit by a golf cart. Are there no rules at this place? This is not camping, it is a place where drunk people driving golf carts meet to drink more. We were, to say the least, frightened to leave our campsite. The music was loud until 4a.m. with no security or management to quiet anyone down. Rules state their quiet hours start at 11p.m. Our children got no sleep at all. Our neighbor, in the site next to ours, had their site vandalized. Some of their things were stolen. This place should not be advertised as a campground. It is a community of "owners" that are always drunk and should be ashamed of where they camp. It should be shut down! It has the potential to be nice if people with authority would run it and quit catering to the offenders. We camped at River Bend RV Resort in a Tent Trailer. Paved roads, level sites, lots of river sites which we had. Swimming pool, pond, and catch and release pond. Laundry was good, went early in the morning. Didn't use the shower or bathrooms. Water and electric only but there is a dump station. All the workers were friendly and helpful. Loved the convenient location to different sites (House on the Rock and the Wisconsin Dells. We loved it. We camped at River Bend RV Resort in a Fifth Wheel. The flyer and website for this campground are very misleading. Make sure to call and get accurate information before booking, and know ahead of time that they are a no refund campground. I didn't have a reservation. We just showed up and picked a site. Little did I know that there is an extra per person charge beyond the general 42 per night fee. Main wristband is good for all water related activities, anything beyond pool, and pond is an additional fee. Wi-Fi is not free, and showers are also a paid service. There are no full hook up sites. Staff in all areas were unfriendly and crabby. Bathrooms were not clean, often flooded and hair was visible in many places. I was very disappointed with this campground in general. We camped at River Bend RV Resort in a Travel Trailer. Arrived to a swamp for a campsite. Had to spread three bales of straw to exit camper. Power was broken, so had no power. Finally got 30 amp, but no 110 or 50amps. 2011 Brochure says free showers, but had to pay for them. Showers and bath rooms by the pool were very dirty. The pool was not open for Friday of Memorial Day and was very dirty. Noise all night long. Quiet hours were not enforced. They seemed totally unprepared for Memorial Day Weekend. Way over priced for what we got. Management was very unsympathetic toward our problems. Would give no refunds at all. Maintenance man was a total grouch, and not customer friendly at all. Sites had minimal gravel, and all around campsites was torn up and muddy. Will never return to this campground. A pity because it could be a real nice place. We camped at River Bend RV Resort in a Fifth Wheel. 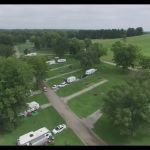 Best campground in 10 years of RVing!! It has something for everyone. Huge pool with 2 racing water slides; kiddie pool; pond filled with lots of inflatables; jumping pillow; mini golf; golf cart rentals need returning by 8:00 PM. All this and more ON a river. WOW! Great deal on firewood! We camped at River Bend RV Resort in a Motorhome. This campground is huge and the traffic through the park is horrible. Golf carts flying around on gravel roads with screaming teenagers in them creating giant dust clouds. Sites are on the small side. Quiet hours are not enforced. People were screaming, playing music and lighting fireworks off until 3am on two nights. Bathrooms are old and out of date but are "cleaned" often. The port o potties were overflowing, stunk by Saturday and not emptied all weekend. When I asked a staff member about it she said that it was Memorial Day weekend and that I should deal with it. There are so many people at this park that the showers, pool and everything else is very crowded and noisy. We will not be returning. We camped at River Bend RV Resort in a Tent Trailer. This is a big FAMILY oriented campground. Amenities include a water slide/water park, Frisbee golf, driving range, tennis court, skate park, river canoeing, etc. Although they are back-ins, the RV spaces are relatively large, and well-spaced, and easily accommodate big rigs. There are no sewer hookups, just water and electric. Wi-Fi works great but cost extra. Pads are gravel and semi-shaded. There are a number of seasonal sites, but they are well maintained and not as junky looking as some places we have stayed. Campground roads are unpaved and very, very dusty. We are grateful we camped during the week when the park was empty. Golf cart and RV traffic Sunday afternoon choked up a fog of dust. Even though the weather was cool, we kept the windows closed and the AC on in order to keep the dust out. In mid Sept., the pond and the river are clogged with green muck. This is the first time in my life that I have ever seen a river of pea soup. It is probably OK earlier in the year. By autumn, it's simply gross. There is a nifty 60 foot hill behind the water park which affords a 350 degree view of the area and is perfect for evening stargazing. The terrain is flat farm fields and perfect for bicycling. There is a security gate at the entrance. Our price reflects a private membership discount. Public rates are $50-75 during peak season. The bathrooms are showers are older and maintained so-so. We camped at River Bend RV Resort in a Motorhome. 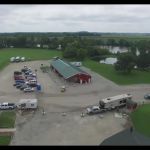 Are you affiliated with River Bend RV Resort ?